My elder daughter is a Tupac Shakur fan, something I've never understood. After reading this book, I can see why. 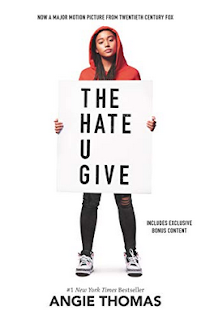 Angie Thomas is a fan of Tupac, too, and the title comes from his album THUG LIFE -- The Hate U Give Little Infants F***s Everybody. 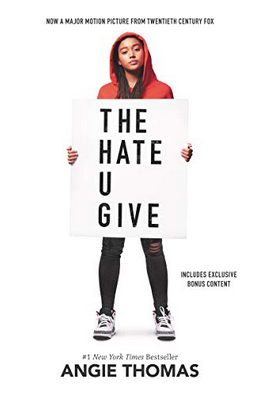 There has been a lot of buzz around The Hate U Give (a movie version was released in the US last year), and rightly so. Angie Thomas takes us inside Starr's world, a world that most white Australians would know little about. Starr is a girl from Garden Heights, a black neighborhood where gangs and drug dealing and shooting deaths are part of everyday life. She is also a student at the predominantly white, middle class school of Williamson, where she has found a white boyfriend, Chris, and learned to 'manage' her blackness so as not to be too confronting for her classmates. The novel begins with the shocking murder of Starr's childhood friend Khalil by a white police officer. As the only witness to the shooting, Starr is immediately in danger, and the book shows the push and pull of her conflicting loyalties in the media circus and investigation that follows. Starr wants to speak up for her friend, but she also wants to protect her family, from the warring gangs of the neighborhood and from the attentions of the police. But nothing is simple in Starr's world: her beloved uncle is also a police officer; her father spent time in jail, but as a trade-off so he could be released from gang allegiance; her boyfriend is white and rich, but he honestly tries to understand Starr's life. I loved the way that Starr was automatically cool at school, but too daggy for the neighborhood. And I loved the way that her passion for justice slowly builds, so that by the end of the book, Starr has learned to use her own weapon: her voice. Realistically, there is no happy ending here, but there is certainly hope. A wonderful book, indeed, and well worth all the hype! Yes, one of the most powerful YA books I've read for ages.